A sigil is an intention that is condensed into a single glyph. They are a wonderfully useful magic form. They are coded with your unique purpose and can be deciphered only by you, allowing your intention to remain a secret as the universe works to align and deliver your desire. This gives them incredible power. Once you have designed a sigil, you can activate and use them in a variety of ways. I have drawn sigils into the bottom crust of a pie before baking, carved them into firewood, carved them into candles before burning them, painted them on rocks and buried them or setting them out for decoration, drawn them in the steam on my mirror after a shower, stuck them on the back of jewelry, and used them in so many other ways. There is no limit to the possibilities when it comes to using sigils. But before you can do any of that, you need to know how to create them. There is no single, definitive method for designing a sigil. The method outlined in the Creating Sigils course is one of the more traditional and common versions. Feel free to experiment to find what works best for you. As long as you create a single symbol from your intention—and that symbol feels powerful to you—it will work. All magic begins with the purpose. Your intention is the most important piece of any magical working. Sigils a great way to practice writing your intention. Looking at the intention you have written down, erase or cross out all of the vowels and any letters that repeat, leaving only one of each consonant from the original sentence. You can break down the letters into simpler shapes (lines and curves) or leave them as they are. You're choice! Play around with these shapes to try to fit them into a single glyph. It’ll take some rearranging and several attempts to get it from the weird looking blob into a power symbol, but just keep trying until it looks like something you like. In some cases it may be enough to simply draw the sigil to activate it, but there are some instances where they need a bit more. Try to think of ways for the sigil to change form in some way when activating. Many of the methods for activating sigils require you to destroy them. This is why is can be nice to keep a record of the ones you’ve drawn. That way anytime in the future, if you want to reuse a sigil for the same purpose you can just go back and look it up, you don’t need to design a new one which can be a long process. Share your experiences and perspective on the Mumbles and Things Facebook page. 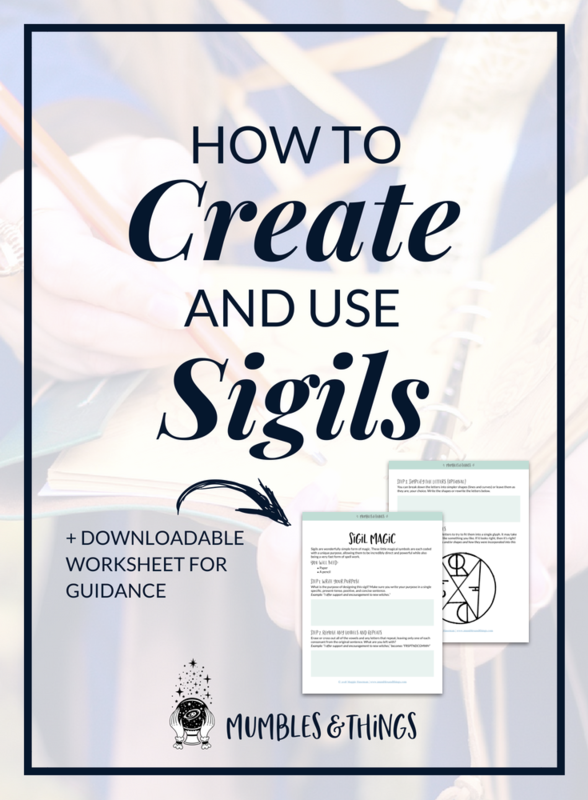 Have you ever used sigils? Tell me about it in a comment below.